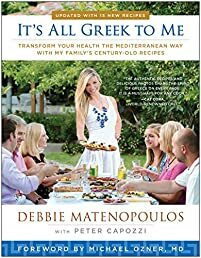 Debbie Matenopoulos, the first member of her family born in America, grew up in a traditional Greek household, eating delicious, authentic Greek cooking that her family had passed down for generations. By the time Debbie had started her television career in New York on The View, she began eating a standard American diet. But despite carefully limiting how much she ate, she found herself gaining weight and lacking energy. As Debbie’s career as an entertainment news reporter and television host on BS, MTV, E!, and other networks had her constantly on the go, she was grabbing whatever food was readily available. It was only when she returned to her traditional Greek diet that she found herself easily—and healthily—realizing her natural weight and regaining her natural energy, stamina, and physique. Now, in It's All Greek to Me, Debbie shares 120 of her family's traditional Greek recipes and adds her own touch to make them even healthier and easier to prepare—plus, this new edition features 15 brand new recipes! After tasting Debbie’s dishes, such as her mouthwatering version of Spanakopita (Spinach Feta Pie), Kalamaria Kaftera (Spicy Calamari), her family’s secret recipe for Baklava, and, of course, Arni kai Patates (Classic Roasted Leg of Lamb with Potatoes)—you’ll be amazed these delicious foods are good for you. With a foreword by Dr. Michael Ozner, one of the nation’s leading cardiologists, the recipes in It’s All Greek to Me adhere to the healthiest diet on the planet: the traditional Mediterranean Diet. Modern science is catching up to what Greeks have known for millennia: health comes from eating natural, whole-food ingredients that haven’t been processed or pumped full of hormones, antibiotics, or preservatives. Let It’s All Greek to Me bring your friends and family together to share in the experience of a Greek meal and way of life. Opa! A portion of all proceeds will benefit the ALS Association.